Plays by young writers, “The Playwrights Project” is 34 years old this year. If you want to know what the future generation of up and coming young thinkers have on their minds you will want to attend any number of the new plays on tap through Jan. 26th. 415 scripts by youngsters ranging in ages 11-18 were submitted this year. Festival Artistic Director Ruff Yeager, in his opening remarks, assured the audience that each and every work submitted was read and judged accordingly. On opening nigh of the festival two finished and fully produced plays and one musical were highlighted: “Sea Of Fog” by Jack Ventimillia, “A Mother’s Mother” by Emma Kuli and “Trash! The Musical”, by Naomi Melville. Each was given the full treatment with professional directors, set designers, lighting designers, costume and sound. Sixteen year old Jack Ventimilia’s “Sea of Fog” delves into the challenges two ‘outsiders struggle with to understand’ and define religion in the modern world. Daxx (Daniel Woods) and Denise (Jalani Blankenship) meet by chance in a familiar area outside the local church graveyard. Denise is overly religious and depends on God for favor and acceptance. Daxx on the other hand is more simplistic in his beliefs. He is preoccupied with saving his sister from a possible date that might go wrong. He shows up with a knife, she is bible bound. The two go back and forth citing confessions they each made in their group therapy as they try to find common ground and close the wedge that separates them. 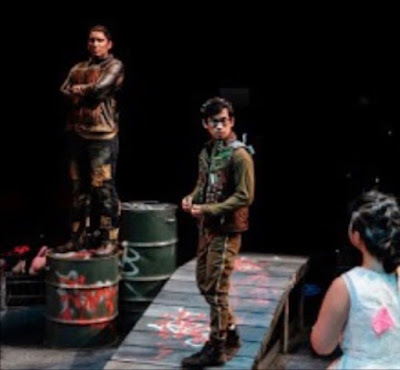 Both young actors deserve kudos for their realistic interpretation of the playwright’s messages. Woods pushes through as his character Daxx questions and then walks away from Blankenship’s Denise strict dogma. 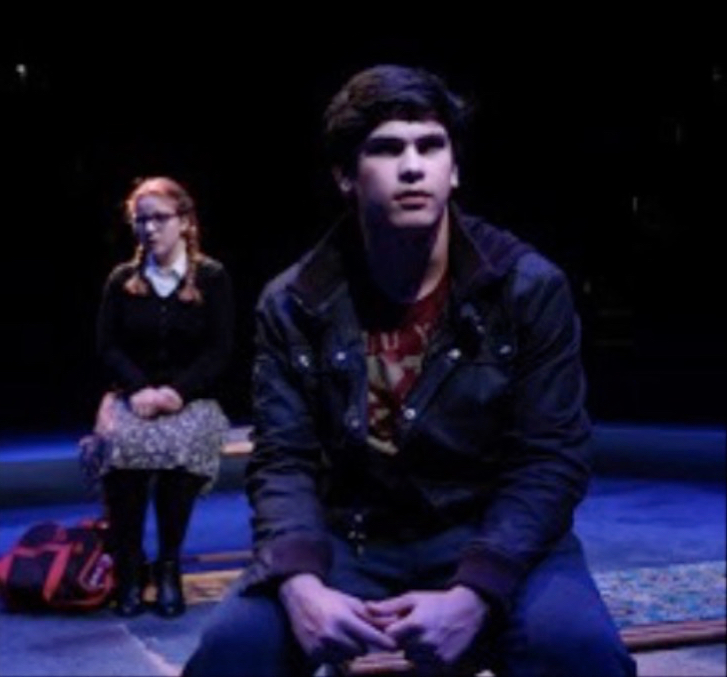 Blankenship is a third year theatre major at UC San Diego and no stranger to acting. This is Woods’ first role acting in a play and he’s off to a great start. 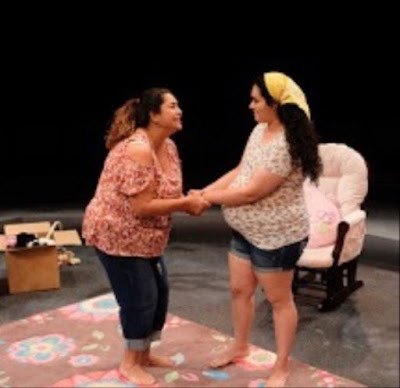 “A Mother’s Mother” by 18-year-old Emma Kuli is an insightful look at a teen pregnancy through the lens of a 17year old girl, Billie (Nancy Batres) whose own mother, Willa (Lettie S. De Anda) was confronted with the same uncertainties of being an unwed mother, that her daughter is now facing. Directed with a caring eye by Deborah Salzer (founding mother of Y.P.P. in 1985), 'Mother's' opens innocently enough as the two argue about what to order out for lunch. They go back and forth and as the topics of spicy food vs. added expenses for extra salsa for their tacos to the stigma of being an unwed teen mother turns serious, the play takes a turn for Willa to share her story with her young daughter, one that was never talked about until now. Willa tells her daughter that she was given the silent treatment by her own mother and then shipped off to an uncaring aunt miles away when her mother learned of her own daughter's pregnancy. She would never do that to her own daughter. Eighteen -year old Ms. Kuli, a freshman at Santa Clara University and is as big as a minute, has captured a moment in a mother/daughter relationship that will cement the two together in the years to come. As birth control becomes more difficult to obtain more talks like this will be happening across the nation. Rather than looking with disdain, acceptance is a must. Miss Kuli, more mature than her age defines has found a compromise that should work for both mothers'; the one that is and the one that is to be. Thanks to the dedicated and realistic acting of both women yours truly felt the bonding as the food fetishes slipped away and a coming together began to grow. Miss De Anda was an Aubrey Award Nominee –Best Actress in “This”. 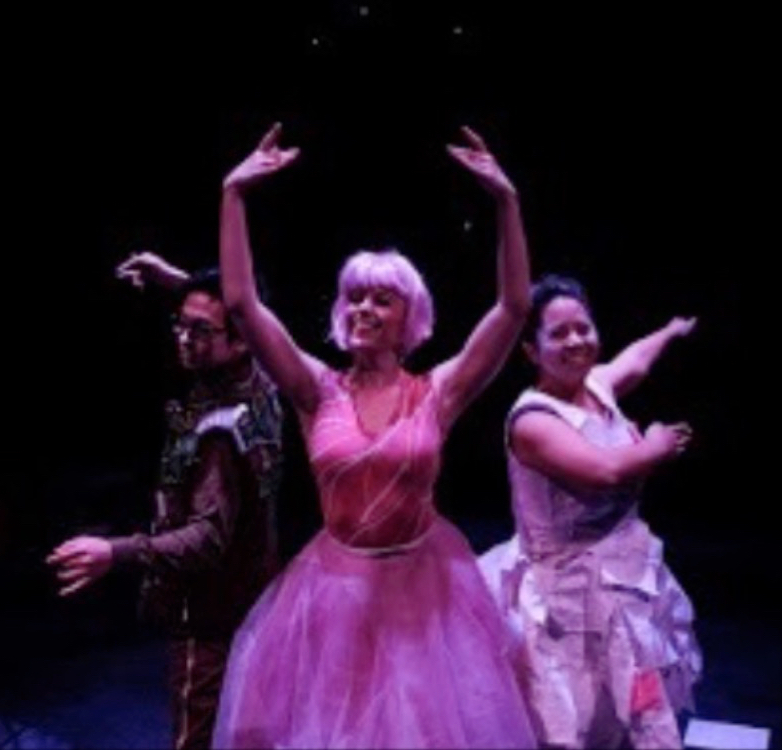 Ms Batres received her MFA in Theatre Performance from University of Texas, El Paso. Hats off to all four women whose understanding of women makes this new play and young playwright so valuable. The Peace de Resistance is 17- year old Naomi Melville’s “Trash! The Musical” directed by Ruff Yeager with music direction by Michelle Gray on piano, choreographed by Dana Maue and mentored by Thomas Hodges was the highlight and most creative of the evening. Melville, a senior at Mt Carmel High School wrote her first ‘script in middle school’, is involved in the drama department and is the Co-Captain of the Improv Team. No question this now generation is, what I refer to ‘as the throw away generation’. Nothing of value has value when something bigger and better comes along. It was just a matter of time that some young, bright, clever and vigilant writer would pen a play or musical about TRASH! Four characters in the cast of Trash! 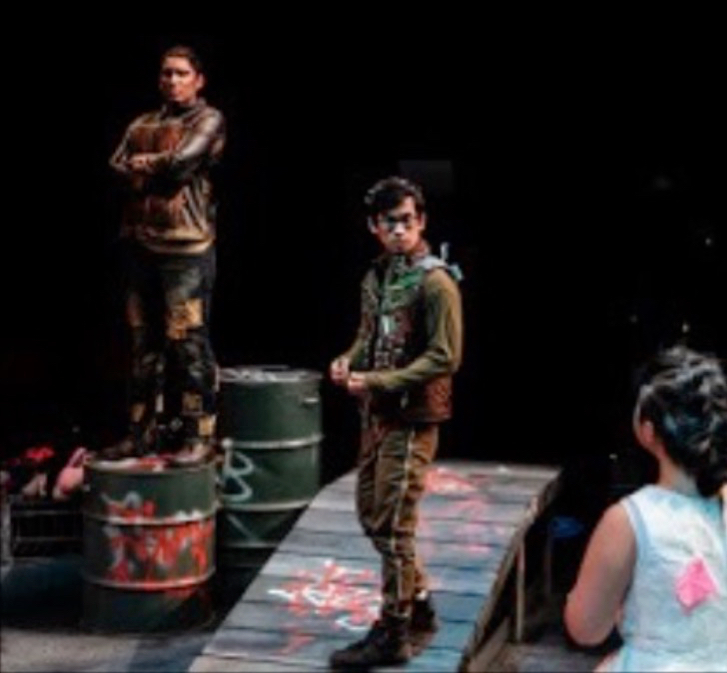 The Musical” make this entry special: Trash (Claudette Santiago), Rusty (Diego Castro), Texas, (Tommy Tran) and Dolly, (Amy Perkins) all find themselves outside, in the alleyway of a building complex, today. Each of the characters is accordingly named, as they are dressed. Texas is a discarded Texas Instrument calculator cleverly dressed with discarded wires and circuit boards attached to his clothes. His with robotic movements are in keeping with his name. Rusty’s braided hair and rusty face and clothes is a discarded and rusty steel drum. He seems to be the spokesperson for the group. Doll, a toy is dressed in a pink ballerina outfit from head to toe claiming she’s there by mistake. Melville’s eye for comedy, music and relevance in today’s world of throw away is exceptional as her musical journey is about to begin. Hats off to this talented cast and especially playwright Melville. And… be on the lookout for this show to be produced on a larger scale in the not too distant future. Other plays included in this years program (that I did not see) and will be given staged readings include ”Just Let Me Help” by 14 year old Marco Herrera and Chris Johnson and “Have Hope” by 11 year old Shyla de Hoop. Check out their web site for more information at playwrightsproject.org.